Tom McAlee NI1N - OB2-40 over a 4 El SteppIR. The OB2-40 has been up and running for about 6 weeks now so I thought I'd give you some feedback now that I've had some time to use it. First, I've attached 2 images of the setup. 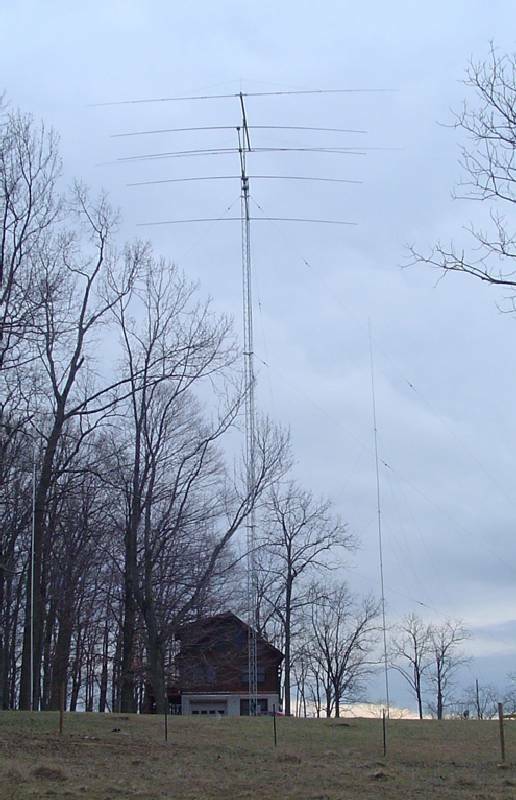 In tower1.jpg you can see the 80 foot tower, the 4 element SteppIR on the bottom and the OB2-40 on top (mounted at 90 feet). Off to the right you can see one of the full-size 80 meter verticals. The other is to the left but not as visible because of the trees behind it. The picture is a little deceiving. The tree branches that appear to be in the front of the tower actually well behind it (toward the house and at least 50 feet away!) The trees to the front appear to be as tall as the tower but they are not. Even the lower antenna is well above any nearby tree, but some of those trees are a good 80 feet closer to the camera than the tower is. The distance from the tower to the house is 140 feet. In tower2.jpg, you can see the two antennas aren't quite lined up. Oooops! It looked right when I was doing it :). They're only off a few degrees though; no big deal, but perhaps I'll fix that next time I need to go up there for something more major. Also in this picture, the branches that appear to be in the middle of the tower are actually no way near it. One thing you can immediately see in tower1.jpg is how the OB2-40's elements show so very little sagging. The SteppIR's elements (which are 36 feet) sag quite noticeably. And, this is after the OB2-40 has been up for a while in the winter and we have had several *severely* windy days. I had initially contacted Jay at Array Solutions to purchase a tower after I had ordered the SteppIR yagi when I was the Dayton hamfest. Naturally, I quickly learned that Jay was not a fan of SteppIR! 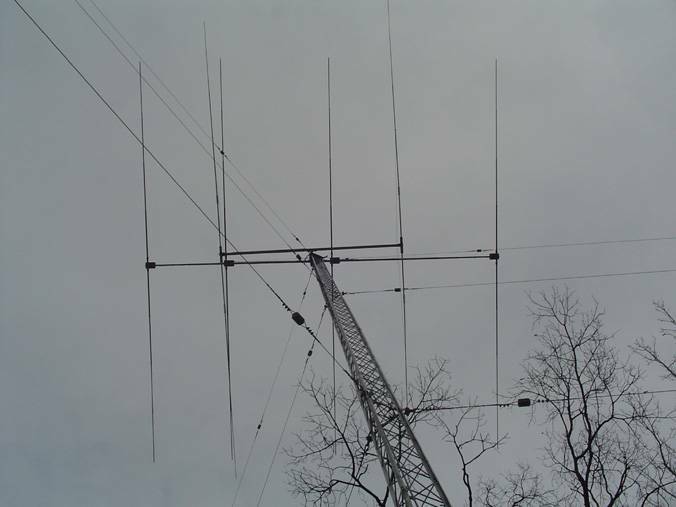 I told him that I was using a 4-square on 40 meters with 480 radials and he suggested a try a 2 element Yagi mounted on the same tower. He said it would out-perform the 4 square. I had my doubts because that antenna worked quite well, but I figured I would give it a try. The tower went up in the middle of the 4 square. I quickly noticed that the tower killed the front-to-back of the 4-square but the forward gain was still ok. I had hoped to have both 40 meter antennas up for comparison purposes, but that couldn't happen. Assuming the OB2-40 out-performed the 4 square, I wanted to make a 2-element 80 meter vertical array out of the old 40 meter verticals (in addition to some tubing from my old 20 meter 4 square). But, I also wanted all of this done by CQ WW CW. So, I put more faith in Jay and took down the 40 meter 4 square so I could work on the various projects nearly simultaneously (I can work on verticals and radials at night with spotlights but won't work on the tower at night). But, I was able to make comparisons between the OB2-40 and my old HF2V vertical. Thats the same antenna I originally compared the 4 square to. So, what I have is a comparison of the OB2-40 to the HF2V and a comparison of the 4-square to the HF2V. fyi, the HF2V has 150 radials cut 4/10-wave for 80m (8/10-wave on 40m). Listening to stations in Europe, there wasn't a shocking difference in forward gain. For the most part, I'd say it was pretty equal. When it comes to front-to-back, I have to say the 4 square beats the OB2-40 (without the tower in the middle -- once the tower was there, the f/b on the 4 square was horrible). That may not sound like such a hot review, but keep in mind I'm comparing it to a 4 square that performed very well. My tests on receiving signals from Europe did not prepare me for what was to come. Wow! The OB2-40 performed inexplicably well!! It's unexplainable because I was constantly beating people through the pileups when I know they have much more than a 2-element "shorty forty" mounted at 80 feet. I did a multi-band effort, so I spent a good part of each night on 80 and 160, but still managed 121 countries on 40 meters. From what I've seen on the 3830 list, in the USA only stations that have a constant presence beat that (multi-multi or single band efforts). And, that's in addition to 629 QSOs on 40m (I wasn't just hunting multipliers the whole time). You know those enormous pileups that result when a rare double multiplier is put on the spotting network in the 2nd day of a contest? The big guns swoop in and its instant chaos. But, time and time again, I worked the station almost immediately, beating out some of what I know are much more elaborate stations. I'm not sure if I understand that, but its ok by me! One thought is that many of those operators only operate contests and don't chase DX on a daily basis; the only technique they know for pile-up cracking is brute force, but quick pile-up cracking is actually a fine art that requires some skill. Thats the only way I can explain it anyway! In any case, the 4 square worked well for DXing but seemed to be lacking when the big boys showed up on the band for a contest. With the 4 square I ended every contest wishing I had something better. With the OB2-40, I ended the contest being completely satisfied with my 40 meter antenna. That has never happened to me before. So now the contest is over and I'm back to my award chasing. One award I've been after is 5BWAZ. The only zone I needed on 40 meters was 24, which is a difficult part of the world from the east coast of the USA. I had never even heard a zone 24 on 40 meters before. But, I discovered something about the OB2-40: when it comes to long path, it absolutely hands down kicks the pants off the 4 square! I was absolutely stunned... in the first week of using it, I worked 4 stations in zone 24 and 2 of them answered MY CQ! And, they were LOUD! One zone 24 station was coming in on the long path S9+10db. He was giving "real" reports (not just 599 to everyone). He answered me on my first call with a 599, then I listened to hear he was giving most people 559 or 569 with an occasional 579. A little further down the band was a station in zone 28 (Indonesia) booming in at S9+20db. He was so loud that I imagine any wet noodle antenna could hear him, so his pileup was quite large. He too was giving out real reports and the pileup was moving quickly.... <call> 55N, <call> 56N. I worked him with one strategically placed call. His response to me: "NI1N 5NN plus big sig". I think it says something when someone takes the time to comment on your signal while they are working a pileup! Another nice one was a comment a station in Europe made. After giving me a 599+40db report, he jokingly told me to point my antenna somewhere else because his XYL was complaining about the TVI that I was causing! Come to think of it... I have not had to wait in a pileup since I started using this antenna. I'll also be adding a review on e-ham.net soon.